For the past few months I’ve been filling various vases with these large, sturdy and very long-lasting leaves from a tree in my backyard. To be honest, I had no idea what the tree was. 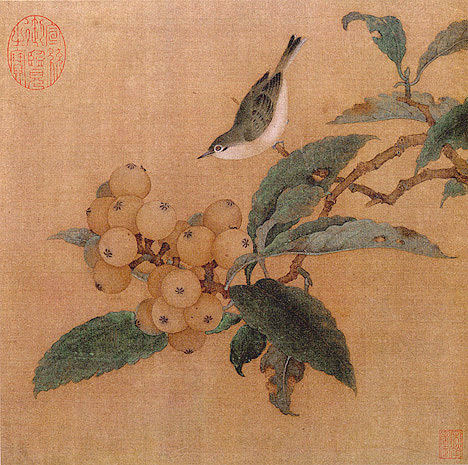 And suddenly one day I went out back and there was fruit on the tree. Not so much as it’s a gold mine, as it is- a gold mine. 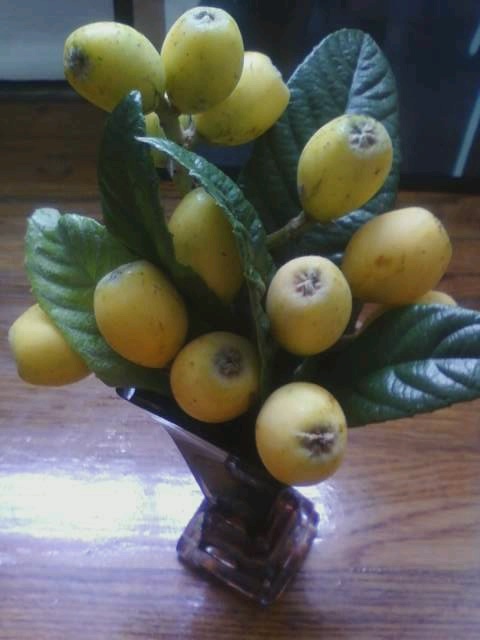 Loquats! 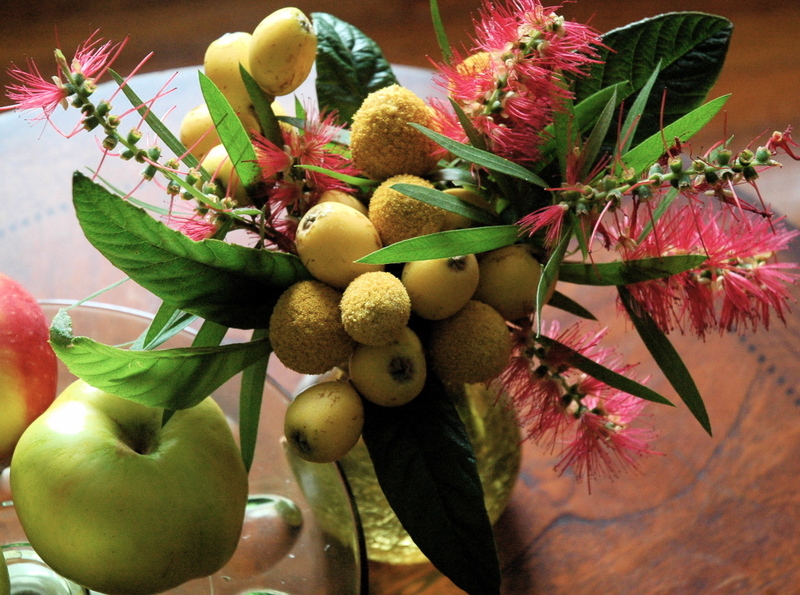 First, I filled the tiny vase with the loquat trimmings..
And today I added the clippings to some Craspedia and Bottle Brush (I happened upon on a rainy stroll) for a more composed look. I’m quite fond of this little arrangement I must say. You can also guarantee I will be taking more snips from the tree to use at work for morning galettes. The lime tree is covered in fragrant blooms and equally covered with delicious bees…I just couldn’t resist plucking a few sprigs from it today, and at the same time giving the ol’ Texas Mountain Laurel tree a little break. I love taking 20 plus photos and having 3 to 5 good ones to choose from. Seems to always work that way, hence the reason I shoot 20 plus images. Here are 2 shots I happen to like. They are both similar angles, almost identical in fact, but each has a different back ground. Still undecided on which I like better.. 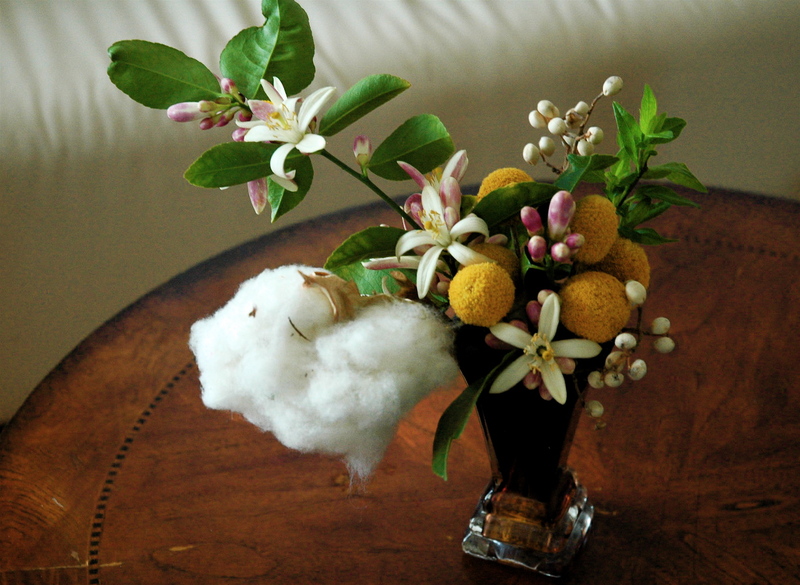 I took some existing dried Crespedia (Billy’s Balls) out of its tiny vase and added the blooming lime, along with cotton on the stem and dried tallow berry. Quite pleased with this small medley. Fresh, bright, cheery and fragrant sans bees. I’ve never been one for dried flowers. What can I say, it just isn’t my thing. I much prefer a revolving door (if you will) of fresh live elements. Whether it’s leftover blooms from an event, fresh yard clippings, or snippets I’ve discovered while out foraging. I like fresh blooms and leaves around me. I can’t help but feel it gives a room clean and fresh energy. 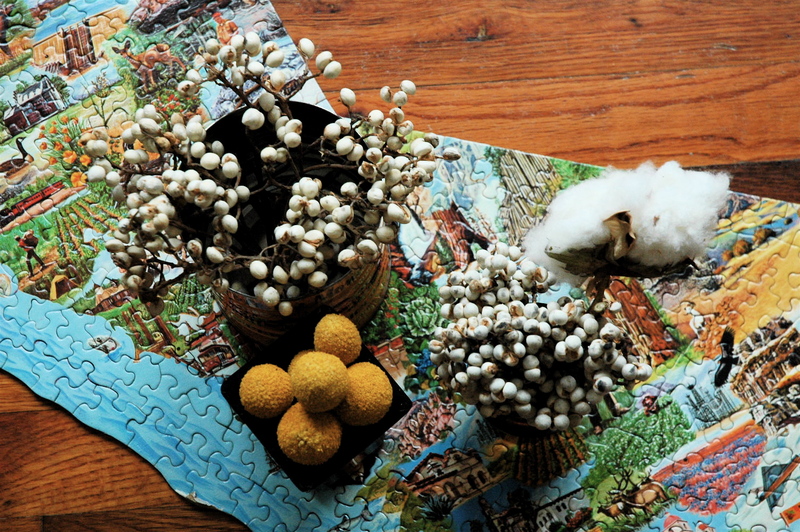 The whole ‘dried’ or ‘fake’ flower scenario conjures up stuffy rooms in a grandparent’s sitting room (possibly mine). 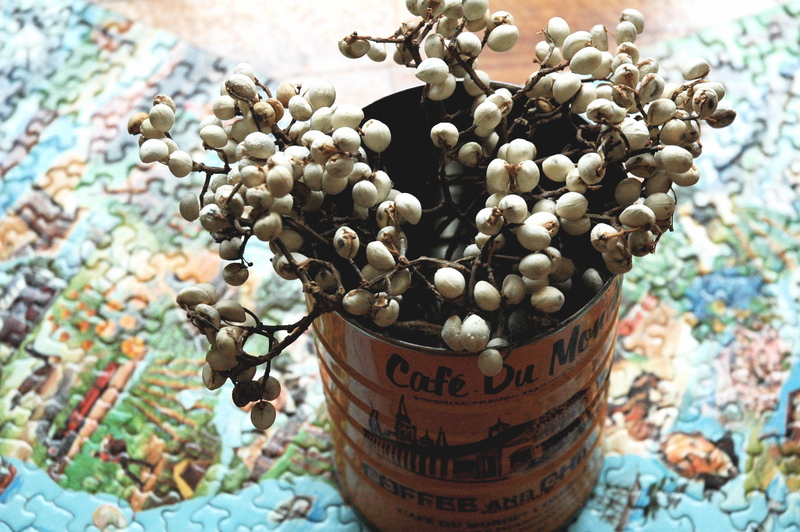 If memory serves: there was a generous layer of dust coating a derelict floral arrangement on a book shelf. Again, just not my thing. I also draw the line at dried eucalyptus. Not that there is anything wrong with it, but it’s the sort of thing my mom might keep in a wicker basket in her sewing room. It also takes me back to unpleasant childhood memories of being dragged into a Garden Ridge (crazy warehouse of craft explosion) against my will. Again, whatever makes you happy (this doesn’t do it for me). But happy it makes her times three. 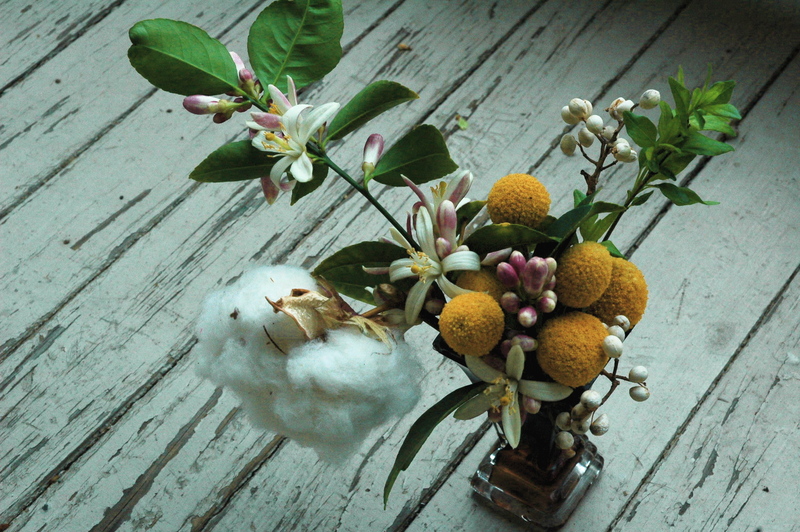 Tallow berry (featured two ways), Crespedia (aka Billy’s Balls) and Cotton on the stem. I unearthed (from a time capsule) quite a load of Tallow berry. 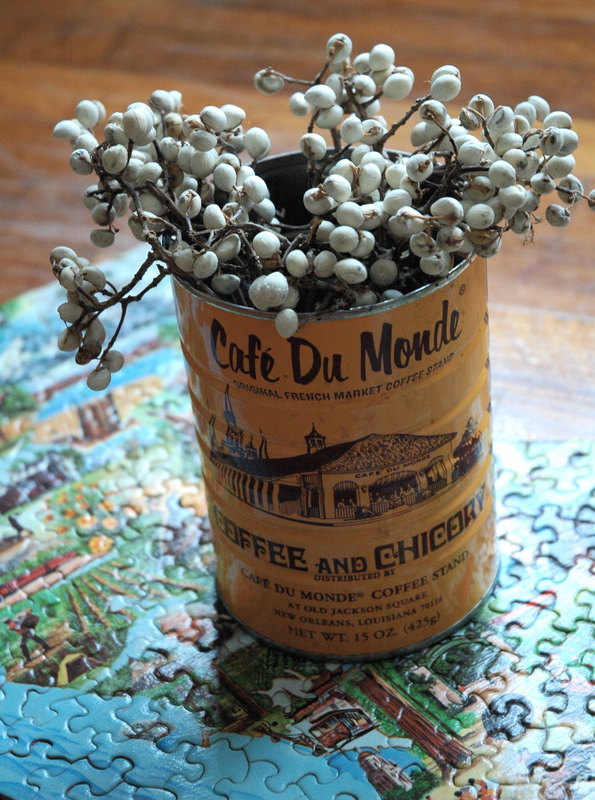 Some I have arranged in an empty (and treasured) Cafe du Monde can. The rest is working in a tighter, more clustered arrangement. I added a stem of cotton for some textured contrast. 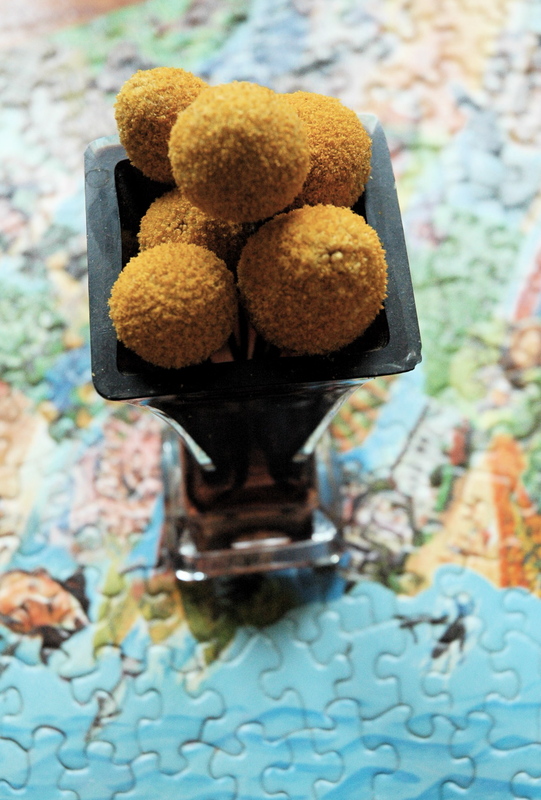 And then there’s Billy’s Balls. Gotta love these. They are so much fun to use when fresh but also dry perfectly, color intact. 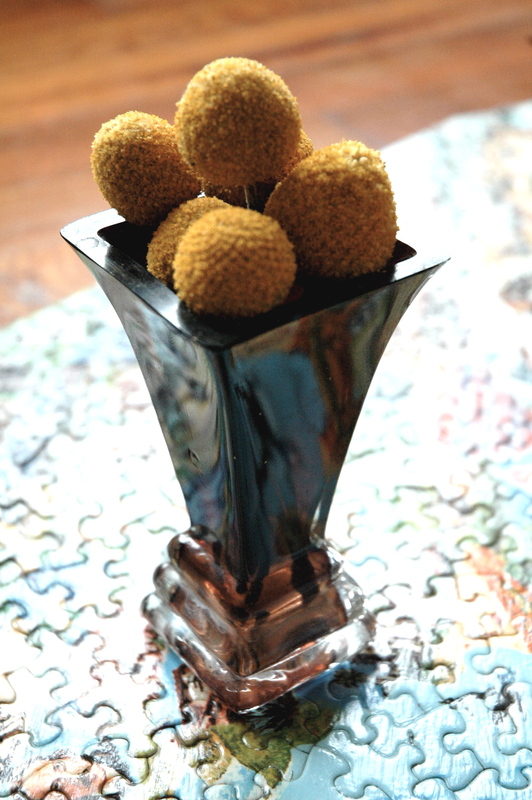 I’ve cut mine down quite a bit and tucked them into a tiny vase, leaving only the little yellow heads visible. 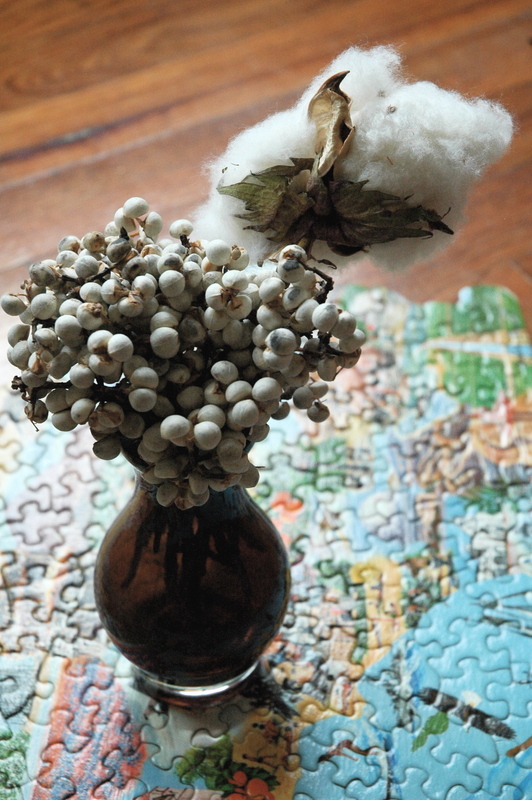 I’m also fond of drying out antique Hydrangea (when it’s in season), using Bittersweet berry (in moderation) and tussling with dried Silver tree in the winter. I’m sure I am forgetting a few others…. What dried elements will you tolerate?